Economic Development | Beyond Suburbia | Making Sustainable Real! I came across this article on Retrofitting the Burbs. Nice round up of ideas. Click here for the entire article by Aron Chang. Also, see my earlier post on home-made services and home occupation in OPEN HOUSE, a one weekend “happening” in Levittown. I believe that as designers we cannot accept as inevitable the decline of suburban neighborhoods, even if these neighborhoods exist, as Leinberger puts it, “on the fringes, in towns far away from the central city, not served by rail transit, and lacking any real core.” To do so will be to overlook important opportunities, and maybe also obligations. These neighborhoods embody major investments of energy and material resources; the housing surplus constitutes a vast store of underused — or “underperforming,” as developers would say — shelter, of habitable spaces already served by basic infrastructure. For the design professions these converging conditions pose an exciting challenge. Can architects, landscape architects and urban designers collaborate with developers, builders, economists, engineers, ecologists, homeowners and homebuyers, all focusing on the collective goal of reimagining the suburban single-family residence and reversing the decline of so many suburbs? And in the process can we effectively address the deeper issues of housing affordability and suburban sprawl? We might start by studying longstanding patterns and practices of housing adaptation in Southern California — a part of the country with no shortage of upscale real estate but with a dearth of affordable options. In Los Angeles it’s not unusual to find recent immigrants, young people, the elderly, poor families and sometimes even professional-class single people doubling up with relatives, or occupying illegal units such as converted garages, or sometimes even living in suburban houses converted into single-room-occupancy dwellings. City officials have estimated that in the late 1990s there were 50,000 to 100,000 people housed in illegally converted garages throughout Los Angeles County, with even more in other forms of substandard housing. Informal units also serve as businesses, e.g., chiropractors’ offices, seamstresses’ workshops, musicians’ instrument shops and schools, etc. In other words, informal or illegal housing is hardly a new phenomenon; in fact, for many years, it has compensated for crucial gaps in the formal housing economy. In Los Angeles and other cities, illegal units are too numerous for authorities to crack down on effectively; and their elimination would displace thousands of families. But they are also too numerous to ignore; no city can plan effectively without a realistic population census. In fact, informal housing is problematic for various reasons. Tenants pay no property taxes or utility fees and have no legal recourse in disputes with landlords; lack of a formal address complicates job and driver license applications; units not built to code may lack good ventilation and safe emergency egress; overcrowding can diminish shared amenities such as street parking; illegal tapping of sewerage and electricity can strain infrastructure; and so on. To reduce or eliminate extralegal housing will require that we repeal federal subsidies that incentivize current patterns of suburban development, as well as overhaul the zoning and regulatory structures that dictate minimum lot sizes, density, setbacks and modes of occupancy. But surely the need to do so is compelling, for extralegal units do more than underscore the actual and unmet needs of the housing market and the limitations of current policy; they function as vital examples of how higher densities, alternate modes of tenancy and ownership, and a responsive and diverse mix of uses not only can help individual residents but also reinvigorate whole neighborhoods. Indeed, they offer promising new models to innovative developers. What designers and planners can do, then, is to reinforce these positive trends and create viable visions of neighborhoods that are equipped to adapt, to change and grow in density and use without diminishing quality of life, while bringing new income, amenities and services. We have to collaborate with policymakers, zoning boards, neighborhood associations, builders, engineers and lawyers; we have to study neighborhoods that have already been densified and diversified by informal housing and start-up businesses; and we have to use our understanding of spatial relationships and land use to modify negative perceptions of infill and mixed use. In doing so, architects might finally succeed in claiming a professional place at the forefront of suburban redevelopment, rather than merely critiquing and bemoaning the waste of so much ill-conceived growth. Some promising initiatives are already underway. At the School of Architecture and Urban Design at UCLA, the design center cityLAB is working on the Backyard Homes project. Under the direction of cityLAB directors Dana Cuff and Roger Sherman, an interdisciplinary team — university designers, community organizations, Los Angeles planning officials, city council staff and the Community Redevelopment Agency, and for-profit and non-profit developers — is examining the potential for infilling workforce housing in the backyards of large residential sites in the Pacoima district of the San Fernando Valley; ultimately the center hopes to encourage experimentation throughout Southern California. Other center activities include researching the history of single-family housing and suburban infill; working with non-profit developers such as Habitat for Humanity to build two units instead of one unit on suburban lots; persuading private homeowners to erect prototype backyard homes; and, scheduled for 2013, constructing a prototype infill unit in the Hammer Museum courtyard. Prototype accessory dwelling unit, SixEight Design, created for the Santa Cruz Accessory Dwelling Unit Program. What is remarkable about the Santa Cruz ADU program is the degree of cooperation that its implementation required — cooperation between city planners and city council, between the community at large and city officials, and between individual stakeholders and the community. In speaking with key individuals, I learned that the program required a shared understanding of the issues of housing affordability and housing choice, and the acknowledgement that thousands of illegal garage conversions throughout Santa Cruz were the direct result of failed policies. For example, a local architect and city council member, Mark Primack — who as a zoning board member in the 1980s and ’90s worked with frustrated homeowners who struggled to comply with restrictive codes — became a strong champion of the ADU Program. With his professional knowledge of building practices, Mark worked with the fire marshal to develop new requirements for sprinklers and firewall separations; with the water department to adjust the requirements for new attachments to utilities for ADUs; and with the planning department to rewrite the parking requirements — all to ensure that the new ADU policies would not be prohibitively costly. In a related effort, a local garden designer, Lynn Robinson, ran successfully for the city council as a “concerned community member” in order to represent neighborhood interests, especially regarding the potential effects of ADUs on privacy, daylight and parking congestion. It is important to note that both Primack and Robinson combined their professional experience — the understanding of building, space and design — with a sustained engagement in political and social processes in order to make the new ADU program a meaningful contribution to the urban future of Santa Cruz. Both the cityLAB project and Santa Cruz program demonstrate the importance of interdisciplinary collaboration and political advocacy. I’d like to further emphasize this with examples from my own research. In 2009 I studied the capacity of single-family residential lots in Temple City, southwest of Los Angeles in the San Gabriel Valley, to accommodate infill rental units that would alleviate the pressures of the regional housing market. Temple City (population 35,558, according to the 2010 U.S. Census) has a large immigrant and non-white population; it’s a place where many garages have already been converted to extralegal units. In thinking about how new units could be inserted into built-out suburban lots, I looked carefully at the city’s zoning code and at the prototypical single-family lot. According to one zoning regulation, a 40-degree plane drawn from the front property line cannot be intersected by any part of the structure in the front 30 feet of the lot. City planners most likely intended this as another means, along with setbacks and height restrictions, of controlling the buildable envelope of single-family homes, bringing order and coherence to the street by dictating a consistent relationship between the house, front yard and street. Rather than challenging the necessity of such a rule, I propose that the 40-degree rule be the model for a new kind of regulation that would allow infill units to be constructed with minimal impact. For example, the city could develop sun-angle zoning, a performance-driven regulation that would require infill units to be designed so that a plane drawn from a given sun angle across the relevant top edge of the infill unit could not block more than 20 percent of a neighboring facade or yard. This regulation would address neighbors’ fears about new structures diminishing their quality of life, while providing a new buildable envelope within with architects could work. The resulting forms would be specific to the climate and existing geometry of the lots. My study also proposes flag-lot parking zones that could alleviate homeowner concerns about parking shortages that might result from new infill or commerical development. The city could purchase rear portions of lots in residential areas and provide street access via long driveways (in plan the long driveway resembles a flag pole; hence the term “flag lot”); these lots would accommodate cars internally within the block, so that the overall appearance of the street would change little as the block capacity expanded. The parking lots could be regulated so that development rights of individual homeowners would be linked to parking spots they own or rent, potentially a means of deriving additional city revenues. Finally, I propose that architects work with engineers and manufacturers to identify building systems and materials especially suitable for infill housing. For example, an exterior envelope of structural insulated panels could be built more quickly than an envelope of standard two-by-four construction, minimizing the disruption to daily life for residents. While none of these strategies alone would ensure an efficient or friction-free transition from lower density single-family neighborhoods into more complex, higher-density and multi-use neighborhoods — and none would be easy to achieve politically — they begin to suggest how architects could use their knowledge of housing typologies and spatial relationships, and their ability to envision possible futures, to work with multiple public-and private-sector collaborators to plan and implement viable approaches to suburban redevelopment. Innovations in zoning policies, construction techniques, property assessment and taxation, parking distribution, maintenance and expansion of utilities, provision of social services, processes for formalizing existing informal housing — all these strategies will be required for us to truly rework the suburbs, one home and one neighborhood at a time. Work such as this is hardly outside the realm of what architects are already doing (again, as we see with cityLAB and Santa Cruz). But to achieve large-scale results, we need to move beyond the ideas competition, the student thesis, the part-time and often pro bono work of architects and institutions. We need to develop broader interest and initiative among an entire generation of practitioners to take on the complexities of innovative suburban redevelopment. Just as urban redevelopment has been at the forefront of academic discourse and planning and design practice for the last several decades, suburban redevelopment must take on similar importance. It’s an urgent issue with arguably greater relevance for the future of the American landscape, both physical and social, and how that landscape is inhabited and traversed. The result might be a new kind of American suburb that grows over time and responds to the needs of a dynamic population as well as to the contingencies of time, place and economics. In an article in The New York Times, architecture educator and critic Witold Rybczynski lamented the monotony of single-family subdivisions across the country. He noted the disproportionate media and public attention to the “glass-roofed museums, the granite-faced office towers, the glamorous hotels,” and pointed out that Americans spend more on the construction of single-family houses than on any other building type. Yet most homebuyers are asked to choose among houses and neighborhoods essentially identical in structure and function, differing only in stylistic flourishes or material finishes. Rybczynski was especially disappointed by the “scant evidence that the [building] industry [is] responding seriously to the chief concern of many young Americans: housing affordability. Instead of pioneering innovations in construction, design and planning that would reduce selling prices and enlarge the size of the first-time-buyer’s market, most builders prefer to cater to the prosperous second- and third-time buyer. The button that is labeled ‘Small and Cheap’ remains unpushed. Too bad.” He then concluded: “It might be time to reconsider the single-family house; either we content ourselves with smaller houses, or we will be obliged to look at alternatives like patio and row houses, and to resurrect such housing types as the California bungalow court and the Georgian housing terrace.” It might be time,wrote Rybcynzksi. It’s especially notable, then, that the article I’ve just quoted was published in 1991. Two decades on, the issues remain just as relevant, except the houses have gotten bigger and more wasteful and the environmental imperatives more urgent. Writing for the same newspaper in 2009, design writer Allison Arieff focused upon the same theme of “suburban and exurban master-planned communities and how to make them better.” She cited big box reuse and the High Line in New York City as examples of the ingenuity designers and developers could apply toward transforming subdivisions into “self-sufficient mixed-use neighborhood[s],” imagining “three-car-garaged McMansions … subdivided into rental units with street-front cafés, shops and other local businesses.” It’s a spirited call to action, whether or not one agrees with the particular post-suburban spin. The problems of affordable housing, sustainable development and the fate of suburban single-family neighborhoods are more pressing than ever. Design alone will never bring about the changes that are necessary and desirable. Rather it is at the intersection of public policy and design, zoning innovation and design, construction innovation and design, neighborhood activism and design, and cultural perception and design, that possibilities for change exist. Elisabet Sahtouris…I don’t know who this lady is, but I’ll bet there’s more pearls of wisdom where this comes from! Kill your enemy or feed your enemy…hmmmm… Tough choice, eh? Elisabet Sahtouris Interview from StormCloud Media on Vimeo. Freiberg Germany has a yearly contest as to who’s neighborhood can have the lowest energy consumption. Another example where competition drives excellence. That’s what I’m talking about. Together we can make sustainable real! Volunteers earn these Time Dollars by doing things for others, such as making them jewelry or baking them pound cake. Edgar Cahn was lying in a hospital bed recovering from a heart attack, when the inspiration came through. He created timebank usa, and a tool for honoring everyone’s contribution has been established. Check out audio file how teen offenders recidivism has been reduced to 10%!! That is incredible. This video brings clarity to the fundamental shift we are involved in…the kind of growth that leaves us living lightly on the planet. Join in! Slip into the nearest phone booth and reappear transformed into the stupendous steward you are. As for the current lack of phone booths, don’t let that small detail get in your way!Together, we can make sustainable real! Ecologize Growth from StormCloud Media on Vimeo. Why wait for the burbs to come back??!! Go Sustainable Urban Village! IMHO the housing construction industry isn’t coming back, until we invent deeply sustainable lifestyles in “Mixed use, mixed income neighborhoods, with convenient lifelong learning and open space”…and that is going to require community collaborations on many levels; identifying and designing to the market demand, integrated systems (water, energy, food, transportation, shared amenities, etc). this was my response to the following news item. New Mexico Business Weekly Long-term mortgages rates moved lower for the seventh consecutive week this week, amid continuing weak economic and housing data. A 30-year fixed-rate mortgage averaged 4.55 percent in the week ending June 2, down from 4.6 percent last week. A 15-year fix fell to 3.74 percent, down from 3.78 percent. A one-year adjustable-rate mortgage averaged 3.13 percent, up from 3.11 percent last week. In New Mexico, a 15-year fixed rate is 3.75 percent, while a 30-year fixed-rate is 4.5 percent, according to MortgageLoan.com. “Fixed rate mortgage rates followed Treasury yields lower this week amid financial market concerns that the current lull in the economy is continuing,” said Freddie Mac (OTC BB: FMCC) Chief Economist Frank Nothaft. The housing market is showing new strain, with the S&P/Case-Shiller housing price report this week saying prices in the nation’s 20 largest cities last quarter were down an average 5.1 percent, the biggest yearly decline since the third quarter of 2009. Jeff Clabaugh of the Washington Business Journal, an affiliated publication, compiled this report. Museum Place Lofts & Townhouses were finished in 2003 in Portland’s Cultural District. The development has 140 apartments atop and behind a Safeway grocery store. Safeway has thrown away its clothes!!! Naked Thursdays!! Come as you are! Yes, I’m babbling…I just learned Safeway in Washington DC has two mixed use redevelopments cooking. Starting with community input sessions, Safeway partners up with a builder and is creating mixed use properties. They’re, in effect, adding residential on top of their grocery stores!!! Well, Duh!! I’m taking steps to create a dense, mixed use, deeply affordable, thriving neighborhood redevelopment in Santa Fe. So when SAFEWAY!!! goes mixed use, I don’t feel like such a pie-in-the-sky Utopian. Damn straight, I’m a pragmatic developer of sustainable neighborhoods!! One of these Safeways is going to have 150 apartments and 10-15 townhouses above the new Safeway. Another has 486 apartments and is going to be 17 stories tall, again above the new Safeway and underground parking. It takes a certain number of residents to make the neighborhood commerical successful. Underground parking is expensive. The numbers have to work. In Santa Fe, we don’t have the traditions of medium high rises to make the densities successful. Our challenge is to have enough buildings with 2-4 stories above commercial and community services on the bottom floor, so the streets become lively with neighbors going about their daily tasks. 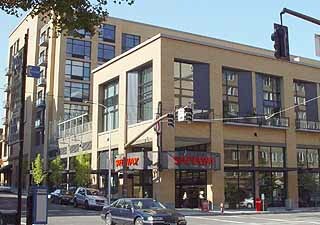 Safeway’s experience partnering with housing developers and working with residents through the zoning process has allowed the company to align itself with public officials who are looking to fashion their neighborhoods as more walkable, urban and environmentally friendly. This is contrast to Wal-Mart, which is looking to sell more groceries and open at least four stores in the District, but is fending off protests. Developing mixed-use projects is more complex work than simply rehabilitating grocery stores, but Tim Baker, vice president of eastern division real estate for Safeway, said company officials have begun meeting with residents about plans to redevelop the property into a mixed-use project. Baker, who used to work for Wal-Mart, said it pays off. “The way we look at it is, we can get an even better project that way,” he said. So come on people. Raise your voices, envision your future sustainable! Together we can make sustainable real!! In times of great change, the opportunities are endless. Maybe Confucius said it hundreds of years ago. Definitely, I said it 20 seconds ago. As Margo is telling me this story the proverbial light bulb went off…. “Those people need each other! !” Well, duh!! This is the kind of connections a Think and Do Tank can create. As we jump into creating sustainable lifestyles, everybody can be an essential participant! From where I stand, Innovation is the name of the game. How can we create an atmosphere conducive to innovation to better support the emerging sustainable economy in …emerging?? I’m envisioning an affordable, interdisciplinary Think and Do Tank, an innovation lab. As I contemplate this “Center for Innovation’, I can see there are several ways it could be configured to serve each region’s needs. This Think and Do Tank could well have an online presence that facilitates innovation. Today, I’m going to focus on “real world” applications. Some businesses, such as Google, pay their employees every week to spend 20% of their time on endeavors outside their “normal” jobs. These pursuits end up generating something like 80% of the innovative products Google develops.